Some say that good leaders are hard to find these days. But the oldest teacher-training institution in the southwestern United States--founded more than 125 years ago--is using new ways to improve schools and to connect with the people who work in them. Faculty members in the Department of Educational Leadership and Counseling, College of Education at Sam Houston State University, are developing leaders in Texas public schools via the Internet. "Online education is coming of age, and Sam Houston State University is leading the way for teachers to develop their leadership skills online," said Beverly J. Irby, who chairs the department. "We're offering a unique graduate degree online. " The Masters Degree in Instructional Leadership is available to teachers who want to improve their skills as leaders. These are teachers who may simply want to improve their own instructional leadership skills or who may serve as subject area coordinators, directors, skills specialists, helping or consulting teachers, supervisors, or department or grade level chairs. This spring 107 cyber warriors are keyboarding, scanning and surfing their way toward the Instructional Leadership degree. Irby said that while the Internet can shrink distances it does not magically ensure quality. "While online instruction is convenient for our students, it is imperative that we maintain the highest quality in this type of instruction," said Irby. "Our faculty has been working and planning this approach over the past two years and they have been to a variety of training workshops for online instruction." 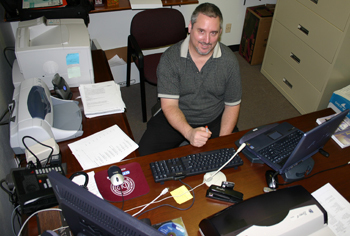 Joe Kortz is a specialist in this area and the online degree coordinator for the department. "We have weekly and individual training sessions for the professors and supporting staff. We train in pedagogical strategies that can best advance a student's knowledge base, and we train in the simple mechanics of use of Blackboard, an online course management and document sharing system," said Kortz. Every conceivable type of document exchange is utilized, he said. This includes peripherals (i.e., MP3 player/recorders, digital cameras, camcorders, and other portable electronics) and software (i.e., HTML conversion software, multimedia tools, etc.) used for oral, visual, and graphical representation of pedagogical instruction in the modern classroom. "In fact, we are the first online program in the state to put the Instructional Leadership Development degree online by the supplemental use of DVD burning and playing," said Kortz. "Such use of peripheral and software adaptation is above the national standard compared to simple online text-based instruction." Shirley Johnson, a faculty member in the department, believes that online instruction stretches faculty members as well as students, requiring her to think about how she could deliver her instruction in a quality manner while not being face-to-face with the students. "Students are occasionally frustrated with technological glitches--Internet service becoming slow or going down completely," said Johnson, "but they have overwhelmingly voted favorably for the classes." The students like the convenience, the improvement in writing skills due to having to write responses and carefully craft questions and answers, and the improvement of their own technological skills, said Johnson. "They feel they learn the concepts and are prepared for leadership." Irby said Sam Houston State will not be stingy with its distance-learning expertise. "We currently have several professors conducting research and writing on online instruction as a delivery method in the discipline of educational leadership," said Irby. "Truly our professors are leaders in this venture, not only at SHSU, but wherever new ideas and change are welcome."